The days are getting shorter and autumn is moving in. Yet in our gardens and at our local farmers’ markets, we have an abundance of fresh produce. Did you know that you can preserve many of your favorite foods in olive oil and enjoy a bit of summer through the fall and winter? For centuries, people have sought ways to preserve their food and reap the benefits of the harvest all year long. In many of the countries around the Mediterranean, one of the most natural ways to preserve food was, and still is, with olive oil. Olive oil can be used to preserve vegetables, meats, fish, cheese and herbs. My Italian family is especially adept at preserving sott'olio (meaning “under the oil”); my French friends remind me that the recipes are really à l’huile and in Spanish, the recipes are en aceite de oliva. Why preserve in olive oil? Olive oil is a natural preservative that prevents spoilage by isolating the food from air, providing a seal that can delay oxidation, deterioration and molding. In the days before refrigeration, the summer months were perhaps the busiest time of year as people spent hours filling canning jars to preserve and store the summer’s bounty. Even today, many people enjoy canning their own fruits and vegetables, not only to preserve the fresh, home-grown taste, but also as a money-saving way to enjoy the best of the garden all year round. While there may be less need to preserve your own food, given the modern conveniences such as refrigeration, commercial cold storage, big box grocery stores and long distance shipping, there is a wonderful satisfaction to being personally involved in the process. Not only can you create your own recipes, but there’s nothing like giving a delicious home-made gift, made from the heart (and the heart of the garden), for others to enjoy. What foods are best suited for preserving in olive oil? What foods are best preserved in olive oil? Of course, we’ll need to wait until the winter to preserve our lemons in olive oil (exquisite). And, while it’s quite possible, I don’t expect many of you will be preserving tuna fish or sardines this summer in your home kitchen (even though on one of my trips to Italy a few years ago, my 96 year-old grandfather did bring back sardines that he had packed in oil while visiting his sister). Now that was a souvenir we treasured! One of my favorite ways to preserve summer is to pick basil from my garden and make pesto for the year. I keep it in small jars in my freezer to add to my winter pastas and soups. Rinse and pat dry the basil leaves. Place in food processor* the basil leaves, garlic, pine nuts, and Extra Virgin Olive Oil. Carefully lift the lid of the blender and scrap the sides of the blender using a small rubber spatula. Store Pesto in small jars and freeze. Always store your finished Pesto sott'olio - meaning you will add an extra protective layer of Extra Virgin Olive Oil. 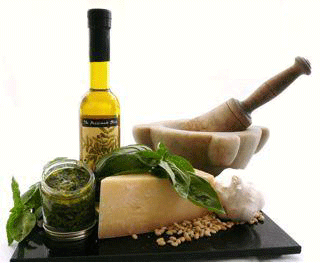 * I sometimes prepare my Pesto using a marble mortar and wooden pestle. The pounding and crushing action of the pestle gives the Pesto a smooth, creamy texture and brings out the flavor of all the ingredients. Vegetables packed in oil require care in preparation. They should be ripe and blemish free. After washing the vegetables, make sure they are dry. Cook vegetables in stainless steel (or non-reactive pans), since often vinegar is used in the preparation. Make sure your tools and containers are clean and dry. Use glass containers for storage with lids that close tightly. Place your food in the containers until full and then completely cover with extra virgin olive oil. Make sure none of the food is protruding above the oil. Add olive oil to form a seal. And speaking of safety, it’s always important to use your eyes and nose to make sure that canned and preserved foods are safe for eating. Before you open a sott'olio jar, be careful. If the lid is bulging or the jar is leaking, it may not have been sealed tightly enough. This indicates that the food has spoiled and you will need to discard it. Check upcoming issues of Pressing Times for Recipes of the Month and preserving food in olive oil.